This looks like some kind of shorebird. The bill is short and rather thick and the body is plump, just right for a plover. The Charadrius or banded plovers lack the heavily spotted upperparts of our quiz bird. Spotted upperparts are however typical of the Pluvialis or tundra plovers, two of which, Black-bellied and American-Golden, occur regularly in Illinois. The undeparts of our quiz bird, especially the sides, look more streaked than barred, favoring Black-bellied Plover, but the overall color looks dark, favoring American-Golden Plover. An obscure but useful field mark for separating these two is the presence or absence of halluces (singular hallux) or hind toes. Among the Pluvialis plovers, only Black-bellied Plover has them, and the halluces can just be seen on our quiz bird. 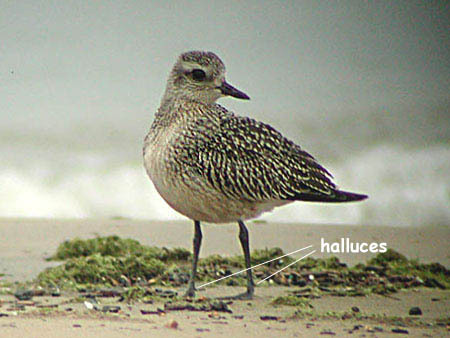 This Black-bellied Plover in fresh juvenile plumage was photographed at Montrose Beach in Chicago on September 19, 2001 by Kanae Hirabayashi.